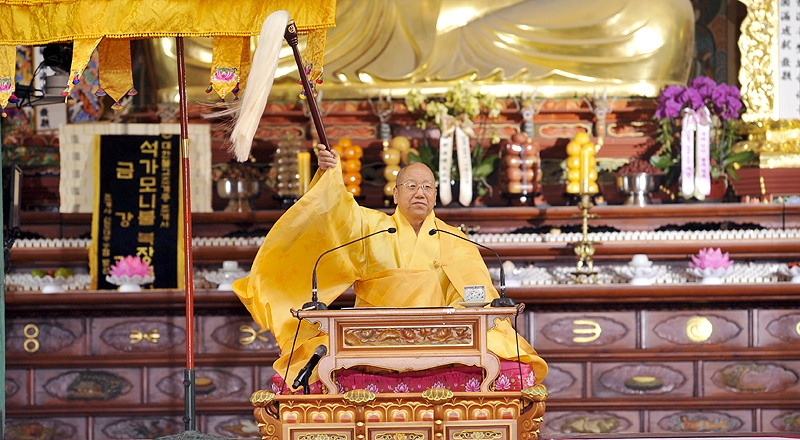 The 14th Supreme Patriarch of the Jogye Order of Korean Buddhism Jinje asked congregates to achieve the unity of the public by healing social conflicts and confrontations through the spirit of hwajaeng (和諍精神), or reconciliation, and integrating the divided and scattered minds of people. At the inauguration ceremony of the 14th Supreme Patriarch held at Jogyesa, Seoul, on March 27, Seon Master Jinje emphasized reconciliation and the Bodhisattva path of Mahayana Buddhism for the marginalized and vulnerable for shared growth. Ven. Jaseung, the President of the Jogye Order, delivered the opening remarks, while Ven. Wonhaeng, the Chairman of the Central Council of the Jogye Order, gave brief introduction about the Supreme Patriarch’s biography and Ven. Milun, the President of the Council of Elders of the Jogye Order, addressed the appointment remarks. The congratulatory message from the Acting President was delivered by Vice Minister Song Soo-keun of Culture, Sports and Tourism on behalf of the Acting President. Congratulatory remarks were also addressed by Ven. Bodagama Chandima Thera from Sri Lanka and Mr. LEE Kee-Heung, the President of the Lay Buddhist Association for the Jogye Order. The inauguration ceremony started with the resonating sound of Dharma bell, followed by fly whisk offering by Ven. Milun and Dharma staff offering by Ven. Jaseung, three bows of respect, song to request a Dharma speech, moment for brief meditation and the Supreme Patriarch’s Dharma speech. The ceremony was attended by members of the Council of Elders of the Jogye Order, abbots of head temples of the Jogye Order districts, leaders of different Buddhist Orders, religious community and politicians.